Port Douglas Australia is a great holiday destination. Port Douglas is a beautiful little town north of Cairns in far north Queensland. It may be a little touristy but it's a very pretty town with colourful shops and cafes, lovely beaches and views over emerald blue waters. It is probably the best place in Australia to visit the Great Barrier Reef, because the coral reef is very close to the coast here. On this page is some information about the town, and in the end of the page is a Port Douglas map. Flagstaff Lookout View, click on thumbnail to buy. Along the Port Douglas road that enters the town from south is the pretty Four Mile Beach with its white sands and bright blue waters. It's a very nice beach and many people like to stay here - there are places like Tropic Breeze Van Village, Port o’ Call Lodge, Pandanus Caravan Park, Dougie’s Backpackers, Lychee Tree, Pelican Inn and Sheraton Mirage Port Douglas. Four Mile Beach. Poster by AllPosters, click on thumbnail to buy. As you enter the town, you come right to Macrossan Street – the main street of Port Douglas, with its colourful shops, bars, cafes and restaurants. In the southern end of Macrossan Street is the Esplanade – a small beachfront with a swimming enclosure (stinger net) in the very northern end of Four Mile Beach. North of it is Flagstaff Hill – a good lookout point if you are up to a bit of a walk. Marina. Poster by AllPosters, click on thumbnail to buy. In the northern end of Macrossan Street is the town’s church St Mary’s by the Sea, the Old Courthouse Museum, and the Sunday Markets hold every Sunday in the ANZAC Park. The church was built in 1911, and the Old Courthouse Museum was the only public building to survive a cyclone the same year, and today it is the oldest building in the town. South of the town is Rainforest Habitat – a fantastic place to learn about rainforest plants and some 180 species of Australian animals such as koalas, kangaroos and cockatoos, and some tropical animals like crocodiles, cassowaries and tree kangaroos. The park is organised in three sections: wetlands, rainforest and grasslands, and there are free guided tours that take you through these different habitats. If you like to get close to parrots and cockatoos, try the Breakfast with the Birds. For many travellers, the main reason to stay in Port Douglas is to visit the coral reef. The trips to the Great Barrier Reef from Port Douglas may be a bit expensive, but they are about the best in Australia. Many companies such as Aristocat, Calypso, Haba, Poseidon, Quicksmart and Tallarook will take you to both snorkelling and diving where you can get really close to the colourful fish and other amazing animals. If you don’t want to snorkel or dive, you can take a trip with a glass bottom boat. One of the most popular trips from Port Douglas is the Low Isles – a lovely coral cay with a sandy beach and a lighthouse. The tour operators that can take you there are Sailaway, Zachariah and Ragamuffin Sail & Snorkel. Low Isles. Poster by AllPosters, click on thumbnail to buy. 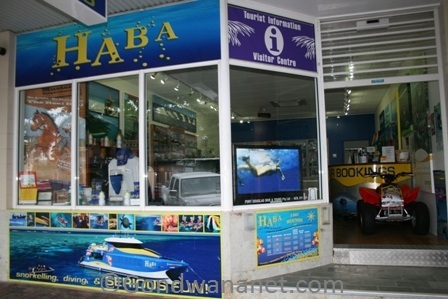 It is also quite popular to get your diving licence in Port Douglas. Discover Dive School and Quicksilver Dive School have courses that include two days theory and pool diving in Palm Cove north of Cairns, and two days open water diving off the coast of Port Douglas. Diving shop, Port Douglas Australia. ©Gondwananet.com. Other tours include Bike’nHike which will take you to mountain biking trips to rainforests in Cape Tribulation and Hidden Valley; Reef & Rainforest Connections that offers a variety of tours to places like Cooktown and Mossman Gorge; and Kuku-Yalanji Dreamtime Walks – some interesting tours by Aboriginal guides who take you to their country in Mossman Gorge. Port Douglas is a great place to eat out and go drinking. There are so many restaurants, bars and cafes that you will definitely find what you like. Most of them are along Macrossan Street: Mango Jam Café, Portofinos, Sassi Cucina, and the famous Iron Bar and Restaurant (where on some nights they have cane toad races!). Others include High Tide on the Esplanade, Salsa Bar & Grill on Wharf Street, Sardi’s on Davidson Street and On the Inlet on Inlet Street. A nice pub to recommend is Court House Hotel, and in the southern end of Wharf Street is the Port Douglas Yacht Club. It is easy to get to Port Douglas from Cairns. Even if you haven’t got your own transport, there are buses run by Coral Reef Coaches, and boats from Cairns to Port Douglas by Quicksilver. And of course, you can rent a car. Most places to stay are expensive and high class. The most common form of accommodation is holiday apartments, followed by resorts and hotels. Budget accommodation does exist but is rare and not as cheap as you'd probably expect. Hotels and motels include Mantra Heritage Hotel, Mantra in the Village Hotel, Palm Villas Hotel, Peninsula Botique Hotel, Reflections Hotel, Sheraton Mirage Hotel, Tropical Nites Holiday Townhouse Hotel, Best Western Holiday Inn Lazy Lizard, and Port Douglas Motel. Resorts include Bay Villas, Beachside Resort, Club Tropical, Freestyle Resort, Hibiscus Resort and Spa, Mantra Aquerous on Port Resort, Mantra on the Inlet Resort, Mantra Portsea Resort, Mercure Treetops Resort, Meridian Resort, Nimrod Resort, Paradise Links Resort, Peppers Bale Resort, Peppers Beach Club Resort, Pink Flamingo Resort, Pool Resort, Port Douglas Sands Resort, Reef Club Resort, Regal Resort, Rendezvous Reef Resort, Rydges Sabaya Resort, Sea Temple Resort, Seion at Bale Resort and Shantara Resort. Holiday apartments include At the Mango Tree, Balboa Apartments, Beach Terraces, Boathouse Apartments, By the Sea Apartments, Central Plaza Resort Apartments, Coconut Grove Apartments, Dreamcatcher Apartments, Latitude 16 Apartments, Le Cher du Monde Apartments, Lychee Tree Holiday Apartments, Mandalay Luxury Beachfront Apartments, Martinique on Macrossan Apartments, Nautilus Holiday Apartments, Oaks Lagoon Resort Apartments, Outrigger Holiday Apartments, Queenslander Apartments, Saltwater Luxury Apartments, The Mediterranian Apartments, The Pavilions Apartments, Ti Tree Resort Holiday Apartments, Verandahs Botique Apartments, and Whitehouse Holiday Apartments. Budget accommodation in Port Douglas is rare but the few places that do exist are backpacker hostels like Parrotfish Backpackers Resort, Port O'Call Lodge, and Dougies Backpackers. Villas, Bed and Breakfast, and other places include Cayman Villas, Coral Sea Villas, Moonsoon Villa B, Villa Sorrento and Villa San Mitchele, 15 Wharf Street Private House, 17 Wharf Street Private House, 23 Murphy Street Villa, 26 Beachfront Mirage Private House, 61 Murphy Street Private House, 63 Murphy Street Private House, Macrossan House, Port Douglas Retreat, and Port Douglas Valley Retreat. Here is the full list of Port Douglas Accomodation. Accommodation. Poster by AllPosters, click on thumbnail to buy. Here's a Port Douglas map, where I have tagged the places that I mentioned on this web page. You can click on the tags to see what places they are, and double-click anywhere on the map to zoom it in and see the places closer. Drag the map to move around, and if you want to see the satellite image with Google Earth, click on "Sat" in the top right hand corner. Had some good time in Port Douglas?